In the following program example, we are going to investigate how the stack based buffer overflow happen. We will use standard C gets() vulnerable function (read from standard input and store in the buffer without bound checking) and the overflow will happen in Test() function. The buffer for Test() function only can hold maximum 3 characters plus NULL, so that 4 and more characters should overflow its buffer and we will try to demonstrate overwriting the saved ebp and the Test()’s return address. The test is done onLinux Fedora Core 3. Then we run the program with input of 3, 5, 8 and 12 characters. Obviously, input with 3 characters will be fine, but more than 3 characters (5, 8 and 12 characters in this case) will generate segmentation fault and the program terminates to avoid other bad consequences. Well, there are two functions which use the buff buffer. Then, which function's buffer (gets() or puts()) that generate the segmentation fault or which one has been over flown? It is left for you to find the answer. Let debug the program using gdb to see what actually happened here. Breakpoint 1 at 0x8048422: file testbuff.c, line 14. By disassembling the program, although we only declare an array with 4 elements (4 bytes), we can see that 20 bytes (0x8 + 0xc) has been allocated for local variable and buffer for Test() function. Let dig in more detail. 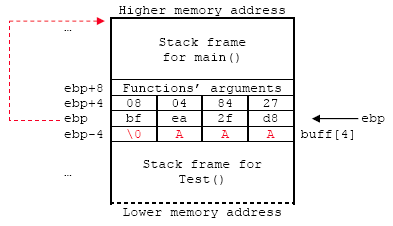 The stack frame illustration for this program is shown below. The buff is stored in the local variable buffer area of Test() function’s stack frame. Keep in mind that we don’t have function’s argument here. The hexadecimal for character ‘A’ is 41 (mark with the red color). 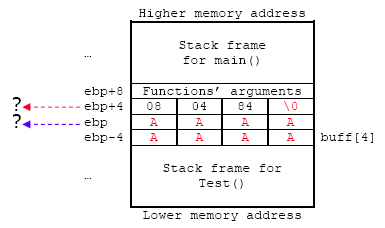 Figure 1: Stack construction during the function call. If the input is three characters of "AAA", the buff array is filled up properly with three characters + NULL. Figure 2: Filling up the buffer in the stack with the 'A' character. When we input five characters, "AAAAA", some area of the saved %ebp will be overwritten as shown below, making the saved %ebp that holds the main() stack frame pointer not valid anymore. When restoring this stack frame pointer later, it will point at the wrong or undefined stack frame. Figure 3: Some portion of the buffer around the ebp has been overwritten. Let input more data, 8 characters: AAAAAAAA. Figure 4: More buffer area has been overwritten with 'A'. Next, input more data, 12 characters: AAAAAAAAAAAA. Figure 5: Critical buffer area has been overwritten, over flown nicely with 'A'. Well, when we input even more data, in this case"AAAAAAAAAAAA", 12 ‘A’ characters (12 bytes); the function’s return address also be overwritten as well! When this return address restored (popped off the stack and loaded into the %eip) the flow of execution will continue at the invalid address 0x41414141, generating the Segmentation fault. The save %ebp and the function’s return address are corrupted. In the real exploit the return address will be overwritten with the meaningful address that the attackers desired such as pointing back to the stack area that already stored with malicious codes or to the system libraries or other vulnerable applications/programs available in the system. 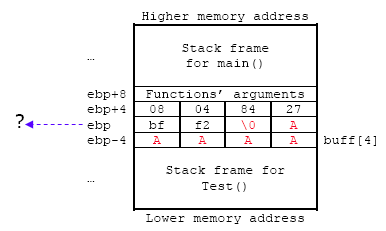 Figure 6: The layout of the stack frame for injecting malicious codes. The idea here if we want to do the simple exploit, we can fill up starting from the Buffer area up to Local variables, The saved %ebp and the function return address. 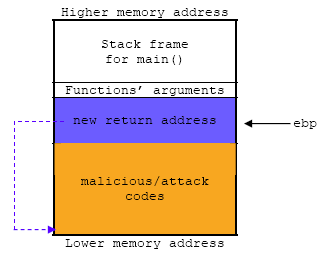 The typical basic buffer overflow exploits will try to overwrite the return address with the address that point back to the buffer where the malicious codes have been injected there as illustrated below. Figure 7: Before code injection - the layout of the stack frame for injecting malicious codes. Figure 8: After code injection - the return address pointing back to our injected code. 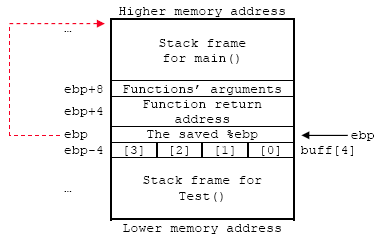 The typical layout that uses the exploit method that overflow the buffer on the stack by injecting the malicious code into the same program’s buffer area of the stack is shown below. Figure 9: Over flow the buffer, injecting the code and pointing back to the code. Injecting the attack codes (hard coded the input in programs, user input from command line or network strings/input redirection via socket – remote exploits or other advanced methods). Change the execution path of the running process to execute the attack code (by overwriting the return address). It is important to note that these two goals are mutually dependent on each other. By injecting attack code without the ability to execute it is not necessarily vulnerability. After knowing the basic how the stack based buffer overflow operates, let investigate the variants used for the exploit. First situation is as explained in the previous examples. This exploit normally uses the applications/programs that having the buffer overflow vulnerabilities. An exploit can trick a function or subroutine to put more data into its buffer than there is space available. This surplus of data will be stored beyond the fixed size buffer (that has been declared in the program through array etc), including the memory location that has the return address stored. By overwriting the return address, which holds the address of the memory location of the code to be executed when the function task is completed, the exploit has the ability to control which code to be executed when the subroutine finished. This type of buffer overflow exploit has been protected in many ways. 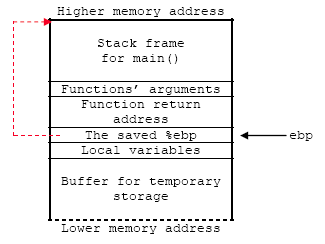 The second situation in exploiting buffer overflow involves just overwriting the function’s return address. However, rather than overwriting it with the address of code in the buffer, it overwrites it with the address of a function or other objects that is already present in the running application such as shared glibc libraries that having buffer overflow vulnerabilities. 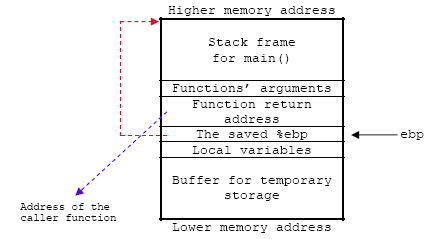 Previously, before any buffer overflow protection implemented, these functions are already loaded into memory of the system atfixed addresses. This type of attack does not depend on executing code on the stack area but does depend on executing the existing and legitimate codes. This exploit normally combined with other type of vulnerabilities such as format strings and Unicode which act as malicious inputs. 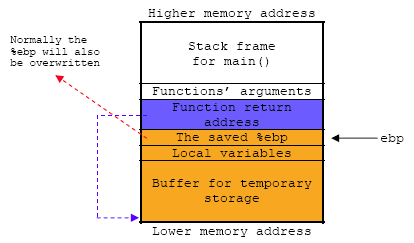 Same as the basic stack overflow, the attacker must know the approximate address of the buffer on the stack and in practice it is quite easy to be obtained. For example, each system running totally similar version Linux OS basically has the similar applications, binaries, and libraries. As a result of these similarities, the sought-after address is very similar or identical for many of the OS. A person who is writing an exploit only has to examine his own system to determine the address that will be similar on all other such systems. This is not unique for example, to Red Hat Linux. This type of exploit also has been protected in several ways. Windows OS also has the same problem but every version of the Windows OS such as Windows 2000 Server and Windows Xp Pro versions have different addresses of the functions that present in the application. These functions normally are Win32 functions. Keep in mind that the same version of the Windows OS but with different Service Pack (SP) or patches may also will have different locations of these functions and libraries. Although every version of the Windows OS has different addresses of the Win32 functions, fortunately these addresses can be found in the standard Windows OS documentation or by using third party program such as PE Browser (http://www.smidgeonsoft.prohosting.com/) utility for the respective Windows OS versions. An example for this exploit is return-to-libc. It is a computer security attack usually starting with a buffer overflow, in which the return address on the stack is replaced by the address of another function of the shared libraries such as printf() family (using the format string vulnerabilities) in the program. This allows attackers to call existing vulnerable functions without injecting malicious code into programs, and can still be a security hole in environments protected by concepts such as a non-executable stack. GOT pointers (.got) of the program’s ELF. DTORS section (.dtors) of the program’s ELF. The start of the programs heap. So the addresses cannot be guessed anymore making it nearly impossible to find the exact address needed for these exploits; the address is now different for every machine as well as being different each time a program starts.